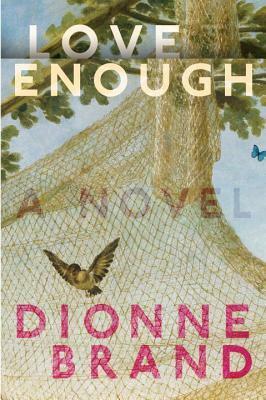 Dionne Brand’s Love Enough is the 22nd Bookmark on the CanLit Trail. Love Enough is a book about the way people’s lives play out and intersect, knowingly or not. In Dionne Brand’s poetic prose, the characters in this book offer us differing perspectives on the same city as they strive to find their own way through it. You never know who you’ll meet in this city. Apart from the constant construction and reconstruction occasioned by winter, there are the appearances and disappearances of people. One could, as is often the case, disappear into someone else. One could become totally invisible. June is a social worker who lives her life passionately and by her own rules. She is capable of seeing beauty where others may not. “She is not the type who is happy the way other people are happy.” But now, in middle-age, she is trying to figure out this love thing. She wants to get out of her own head, a stoop from which she can pick a fight with the most benevolent human being in the world. Even when the sky is lilac or violet and even if two butterflies stop her day with their urgent life, she hovers on this stoop like a preying mantis, looking harmless but not at all harmless. Her stick of a body is deceptive. Her poised look, her brain in compressed rage – all the reedy details of a life lived cautiously and suspiciously yet on the verge of weeping at small beautiful occurrences. Yes, June collects sadness. What would happen if no one remembered sadness? We’d walk around mutilated and mutilating and not know how we got there or have any remorse. Lia recounts her life as the daughter of Mercede, a hard woman to love. She and her brother, Ghost, react differently to their upbringing – Lia leaves as soon as she can, finding jobs to support herself. Ghost sticks around, fights with his mother, gets into trouble. Mercede’s love was exhausting because it needed love back constantly. Lia and Germain were children and didn’t always know how to love back. They simply knew how to love, and at times they they simply wanted to run or play and have love waiting for them when they returned. Mercede’s love was a burning, wanting love. Mercede’s love could not hold out against her panic of never being loved enough. There is nothing universal or timeless about this love business… It is hard if you really want to do it right. You can find the passage used by Project Bookmark Canada here. I’d love to see something like this is the UK. A great way to construct a literary holiday! This literary bookmark thing is so cool. Thanks for sharing with us. I like the sound of this. Intersecting family stories and relationships with an observant eye – I like those kinds of books. These kinds of books/stories are probably among my favourite! This sounds beautiful Naomi – particularly that quote about June. She knows how to write! One of the places I lived in Toronto was quite near where this Bookmark is. I’ve never read her before, but she sounds good from your review. I found her writing very poetic. Those quotes are extraordinary- what a writer! As a city-dweller myself I’m also always keen to see how writers capture it. This kind of story makes the world feel small, in a totally believable way! Ah, I remember taking SO many quotes from this read. It felt like I spent as much time scribbling out memorable passages as I spent actually reading the book (it’s not really that long, even though there’s a lot of story inside). My favourite of hers, though, is What We All Want. Oh, I dunno, now that i say that, I am reminded that I would like to reread At the Full and Change of the Moon, because that was my first of her books, and it was the one that landed her on my MustReadEverything list, so I must have loved it pretty hard. So pleased you enjoyed it too. And here’s to the bookmarks, ever increasing our reading lists! I felt the same way while reading this – that I was spending just as much time taking notes as reading! Have you ever read In Another Place, Not Here? That’s the one I have on my shelf. Yes, I really like that one too. And it’s very accessible. I was wondering, recently, if it might be the best place to begin with her work, but it’s been so long since i read it that I can’t say for sure. My review is here if you’re curious (no spoilers, of course). Oh, wow, those quotes are intriguing! Love the Bookmarks idea (though the Project Bookmark website didn’t have a lot of info). I could imagine spending my life putting little markers to say such and such a book was set here. I used my one European holiday to see Maigret’s Paris, Hydra for Australian writers Charmian Clift and George Johnston, and Huesca, Spain for George Orwell’s Homage to Catalonia. I would expect nothing less of your trip to Europe! Visiting literary sites is pretty much the same as visiting the Bookmarks, except the Bookmarks give you a passage from the book that takes place in the spot where you’re standing. Which is pretty cool.